The Invacare Drop-Arm commode is designed to help accommodate transfers in restricted or confined areas. 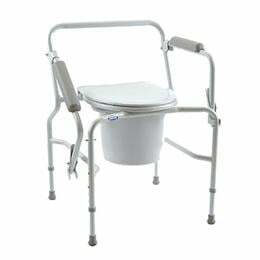 This commode can be used over the toilet with use of optional splash shield. The drop-arm is easy to operate: the user simply pushes the lever to release the arm, or lifts the lever to lock it in the upright position. This commode features a 250 lbs. weight capacity. Inside seat width: 8 1/4"
Inside seat depth: 9 1/2"
Overall height adjustment range: 28 3/4" - 33 1/4"
Seat-to-floor height adjustment range: 17" - 21"